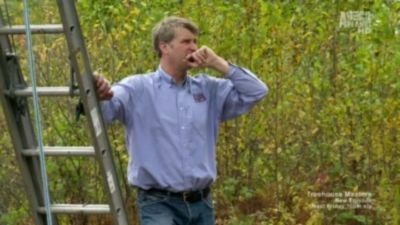 People who know and work with Pete Nelson describe him as a tree whisperer. For his part, Nelson lets the trees do the talking. 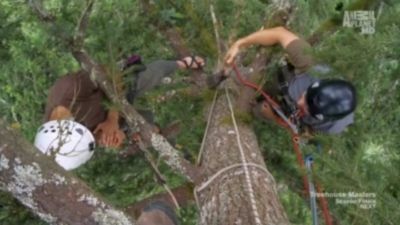 He's a world-renowned treehouse designer and builder, and this series documents the work he and his team of craftsmen -- including his son Charlie -- do to create incredible homes and busines ses in nature's canopy. Pete uses a combination of science and art to realize clients' sky-high aspirations of magnificent multibedroom treehouses with elaborate kitchens and bathrooms, or simpler, peaceful one-room escapes. Other backyard escapes featured in the series include a spa retreat, a brewery, and a honeymoon suite. ``We awaken that inner child who dreams of living among the trees,'' Pete says. Pete journeys to Kauai to build a sky-wave treehouse for a couple who ditched the mainland for a laid-back lifestyle and transforms a bohemian treehouse for two former professional surfers into a masterpiece with a crow's nest 60 feet off the ground. Dreams are coming to life in Oregon as Pete builds for Marlene, an 81-year-old woman who is finally getting one of her greatest wishes fulfilled: a treehouse; Marlene is giddy with excitement for this new adventure. Pete explores tree houses worldwide that tap into one's inner spirits; a manta-ray-shaped tree house within a Thai jungle; a spirit-soothing retreat hidden in Australia's wilderness. Pete heads to Alabama's Appalachia to build a super spy treehouse; he pulls out all the stops to make the client's espionage-themed dreams come true; gadgets, hidden passageways, secret rooms and more. 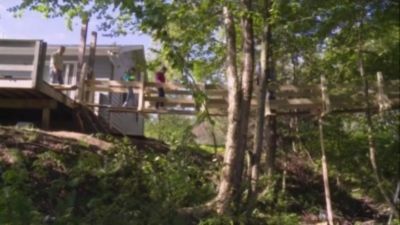 Pete's fun-loving friend is the lucky recipient of a treehouse built strictly for good times; the team builds a dream of a treehouse complete with a wine bar, a loft, and their first-ever hot tub in the woods of Western Washington. Pete creates an arboreal abode for an adventurous Alaskan couple that offers all the warm fuzzies they get from the outdoors without having to brave the bitter mountain cold, and heats things up by installing a sauna in the trees! Pete builds a half spaceship, half horseshoe crab, zinc-wrapped treehouse at state-of-the-art kids camp, Camp Southern Ground, at the request of country music superstar Zac Brown. An Arizona boy's Make-a-Wish request is granted when Pete designs a tree house with a ramp for his wheelchair and characters from the 2014 film "The Boxtrolls." Pete builds ski lodge-style treehouse complete with an indoor-outdoor fireplace and a rooftop snowmaker for a ski-loving family. Two sisters who run their family’s rural inn in Farmington, Pennsylvania, present Pete with a bear of a task: build an observation treehouse on their 1000-acre property, where they can watch the black bears roaming the land. Pete is a little nervous at first when it comes to his team building in the midst of these wild beasts, but he turns his fear into inspiration by creating his first-ever mid-century decagon treehouse with walls of glass and windows, a wrap-around deck, cathedral ceilings and a closed-circuit bear-cam tracking system nestled among three white oaks and standing more than 20 feet from the ground. For the interior, Pete incorporates mission-style furniture, a roaring fireplace and a handmade oak bar. In the Season 1 finale, Pete builds a honeymoon suite for a couple who want to get married at Treehouse Point, but all of the other accommodations are booked. On this special episode Pete and the NTS crew build the “Ultimate Treehouse” for the lucky winner of the Ultimate Treehouse Giveaway. Pete makes a tree house touchdown in Pittsburgh for Antonio Brown, wide receiver for the Steelers. Pete is building a luxury skybox with a two-story window wall that overlooks a custom basketball court and football field. Adventurous Texas family, living on a 200-acre ranch, want a camouflaged treehouse that also serves as a guest house. 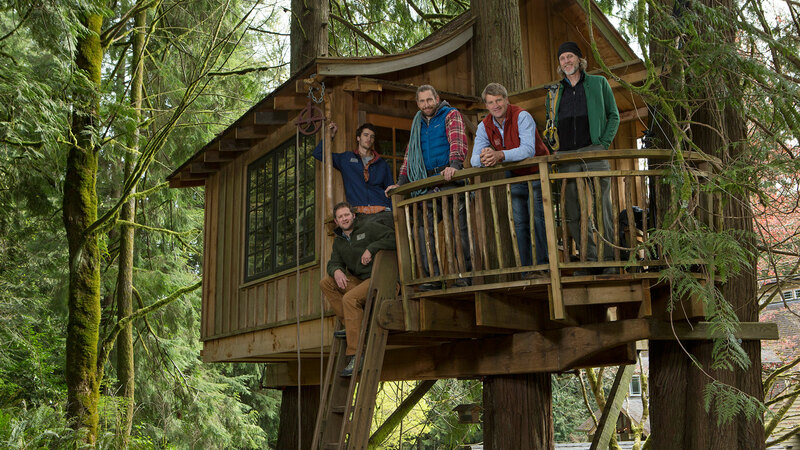 Pete is back in Texas to build a sophisticated, sleek-and-chic treehouse in the heart of Dallas; Daryl and the NTS team put treehouse engineering to the ultimate test at Washington State University, proving down-to-the-pound the power of the TAB. Pete connects with old friends in Canton, NC to build them Zen-like sanctuary in the trees. Battling a record-fast 9-day build window, the team stays calm in constructing a retreat 15-ft high with a picture perfect view of the Blue Ridge Mountains. Just one day of Christmas cheer isn’t enough for a real-life Santa and Mrs. Claus, who celebrate the season 365 days a year in Southern California. 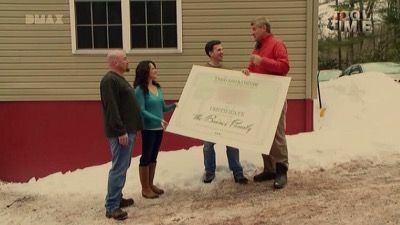 Old St. Nick and the missus call on Pete and his crew to spruce up their yard with some holiday magic. 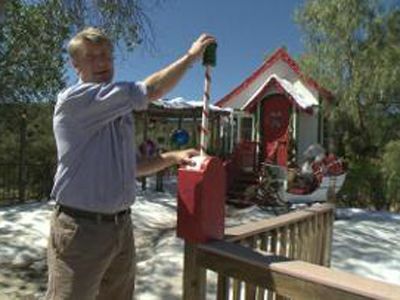 Pete creates a treehouse workshop complete with Santa's red chair, a naughty-or-nice drawbridge, a secret elf trap door, a candy cane and holly access bridge and some miracle Christmas snow...in the California desert! A couple wants a treehouse inspired by a children's book with a grown-up twist, and at the same time, Pete and the team build a whimsical Tudor-style theatre treehouse. A friend of Pete's has the treehouse bug and decides to open a treehouse B&B; the classic A-Frame structure will have all the amenities and a waterfall that pours from the wraparound deck to the pond below. Treehouse designer Pete Nelson and his team turn clients' sky-high dreams into incredible realities. 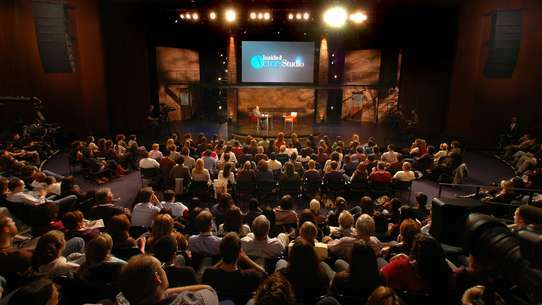 Pete tackles the first climb-in movie theater; concessions are served to seating pods through a pulley system and loungers elevate into the trees to give perfect views of the big screen; a tree house for monkeys at the Los Angeles Zoo. Pete and the crew join a group of young carpenters from Sawhorse Revolution, an organization that introduces carpentry to students with community service projects, to build a treehouse escape. 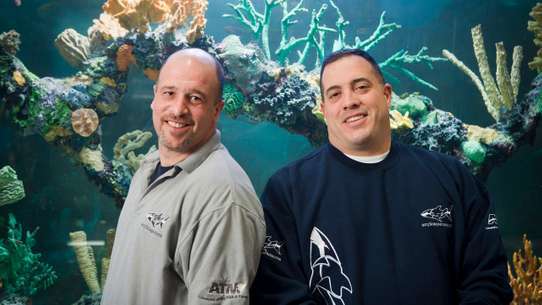 Pete and NTS build a tree house for the For-Mar Nature Preserve just outside Flint, Mich.; the 5-platform nature headquarters serves as a positive addition to a community still reeling from the water crisis that began in 2014. Pete builds an incredible, adventure-themed treehouse for a young, exploration-loving family in the heart of Pennsylvania’s Pocono Mountains. The family calls Pete and his crew to create a massive, two-story jungle masterpiece packed with secret doors and hidden passageways within a cluster of cherry trees! Pete delivers not just one but two bouncy suspension bridges, a daring rock-climbing wall anda living wall containing more than 700 live plants for this colossal treehouse, which overlooks a deep gorge. With a secret sarcophagus entrance, a second-sleeping loft and loads of adventurous novelties, this treehouse is sure to bring the family hours of fun, especially when Pete reveals his tailored, sentimental surprise: a tribute to the family’s beloved grandmother.